B&NES is denying the Council has made a ‘U-turn’ regarding its proposed relocation of the Central Library to the ‘One-Stop Shop’ in Manvers Street. On its website it says: ‘The Council has not yet reached a decision on whether to move Bath Library, but is currently undertaking a consultation on a proposal to integrate the Library and Customer Services. The consultation focuses on what services local people want provided. The outcome of this will be made public and will form part of a business case. There will then be a further period of public consultation. This is not a U-turn as it has always been our intention to hold further consultations as the Council has a duty to meet the requirements of the Museum and Library Services Act 2010 and public equality duties. At this stage we cannot say what the final proposals for Bath Library will be as the business case has not been produced. We are at the start of a 3 year process seeking to integrate and modernise the Library Service with other customer facing services. 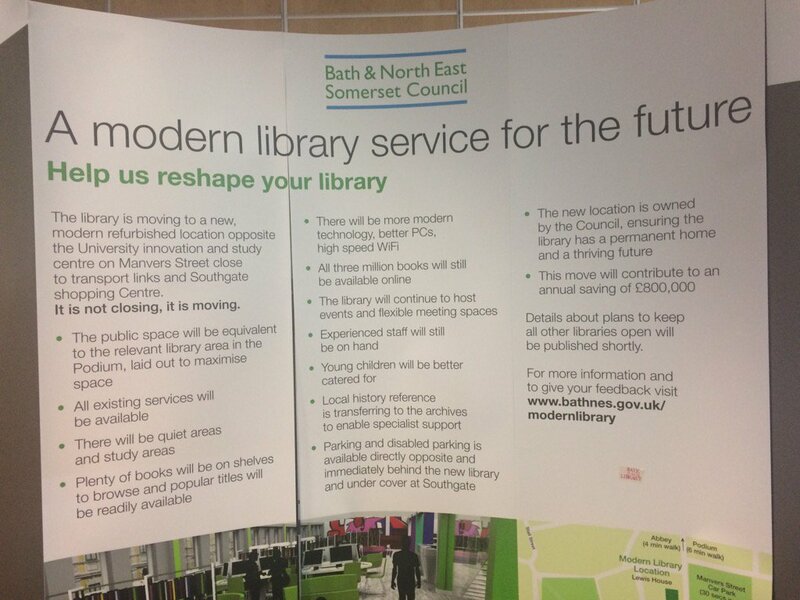 While some other local authorities have been forced to cut library services Bath & North East Somerset Council remains committed to the provision of quality Library Services.